Two years ago, Russian submarines planted a rustproof titanium flag on the seabed beneath the North Pole. Although a potentially provocative act, the majority of Russians heartily approved. On Soviet maps, the dotted line of the Russian frontier stretched from the country's eastern and western borders to the North Pole and for generations Russians have considered this vast ice desert as part of their territory. The Arctic has captured the attention of all the major world powers, and Russia is no exception. Growing interest in the Arctic has been driven by the recent spike in energy prices, which makes developing energy resources in hard-to-reach areas increasingly lucrative. Onshore mineral resources are being depleted, and the Arctic will soon become the world's only untapped reserve. Consequently, no contender for the North Pole's resources is likely to give up without a struggle. The potential is enormous: the Arctic is said to contain up to 500bn barrels of oil, huge gas reserves and significant deposits of diamonds, nickel, tin and gold. Researchers are hurrying to update estimates of the Arctic's ice-locked riches. Science magazine recently published a detailed map of the region's oil and gas deposits, which is the result of a comprehensive five-year study conducted by Donald Gautier of the US Geological Survey. According to the study, the Arctic holds 30pc of the world's undiscovered gas and about 13pc of oil. Most of the oil reserves lie within the state of Alaska, in the United States, while the gas is concentrated in Russian territory. The study also revealed that most fossil fuel deposits are likely to be found under shallow water (less than 500m deep), which means oil and gas deposits will soon be accessible for drilling and extraction. Over the last 10-15 years, the US, Japan, South Korea and Norway have developed new weather-resistant equipment that can access oil and gas deposits lying 2,000 metres under ice-covered offshore areas. Since building an Arctic pipeline is prohibitively expensive, the only way to ship liquefied gas from the region is by tanker. Russia's Arctic neighbours are busy building new offshore platforms and icebreaking gas transports, probing the Arctic sea shelf and collecting data that would substantiate their claims on the region's proven and probable reserves. Russian experts point out that ongoing exploration of the Arctic reserves will soon reveal new facts that could dramatically change the whole North Pole picture. It is now clear that the Arctic holds extensive reserves of natural gas and gas hydrate (gas-rich ice). 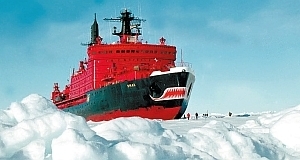 Russia, as the world's biggest gas supplier, regards the Arctic deposits as a strategic priority. According to the Russian government's strategy, "exploitation of the Arctic's energy reserves" will start in 2020. Russian gas companies are pinning most of their hopes on the Arctic seabed. Russia's biggest gas fields - Shtokmanovskoye, Rusanovskoye and Lenigradskoye - are all in the western Arctic. About 70pc of all Russia's offshore oil and 90pc of its natural gas are concentrated in the Arctic sea shelf and basin. This region, representing only 1pc of Russia's total population, accounts for 20pc of Russian GDP and about 22pc of its exports. The total value of Russia's proven and potential reserves in the Arctic is estimated at $15 trillion. Obviously, Russia is prepared to protect its interests in the Arctic. In mid-May, President Dmitry Medvedev approved the Russian National Security Strategy until 2020, which highlighted the Arctic as a new area for potential armed conflict. According to the strategy, Russia will deploy special troops in the disputed area to protect Russia's interests and security "in any military and political environment". Nikolai Makarov, first deputy defence minister and chief of the general staff, recently said: "Russia will have to work hard to protect its interests in the Arctic." Konstantin Simonov, director of the National Energy Security Fund, puts it even more bluntly. Speaking at the Russia, Nato and Future of European Security Conference, he said Nato countries are aggressively expanding their military presence in the region. He believed a military clash in the Arctic is only 20 years away. Russia's Arctic rivals are five ambitious Nato members: the US, Canada, Norway, Iceland and Denmark/Greenland. A recent Nato statement proclaiming the Arctic "its strategic priority" is only increasing tensions. Moreover, each of these countries also has a military interest in the Arctic. For example, the US National Security Directive is explicit about the country's broad and fundamental national security interests in the Arctic region, including "missile defence and early warning, strategic deterrence, maritime presence, and maritime security operations". The US is currently upgrading an early warning radar station in Greenland. Nato's growing presence in the Arctic is compelling evidence of preparation for a military conflict. The scope of Nato member country activities is quite impressive. Each year, Canada holds military exercises aimed at asserting sovereignty over the northern territories. Recently, the Canadian government unveiled plans to establish a new army training centre for 100 personnel in Resolute Bay, as well as to build a new deep-sea port at the north of Baffin Island. In addition, Canada will build six to eight new patrol vessels for deployment in the Northwest Passage. Traditionally dovish, Denmark has chosen to follow Canada's example and has increased its military presence in Arctic northern Greenland by deploying a fast response military unit and establishing a command post. The US and Norway are also building ice-strengthened vessels for their respective navies. Experts believe Nato icebreakers patrolling the region are there to reinforce members' claims on North Pole riches rather than study polar bears. The icy Arctic is turning into a real hot spot, and this has more to do with geopolitics than climate change. Disputes over the Arctic's discovered and potential deposits are likely to increase. Norway led the way two years ago, submitting a claim for an extensive chunk of Svalbard and the Jan Mayen continental shelf. As the result, the UN commission formally granted Norway some 235,000 sq km of Arctic and Atlantic Ocean seabed, which constitutes as much as three quarters of the region's total land territory. What's behind Norway's Arctic rush? According to experts, Norway's North Sea oil production will decline some 50pc by 2030, providing the impetus for rapid action. The UN Convention on the Law of the Sea, which Russia joined more than 10 years ago, gives all countries ratifying the treaty (prior to May 13, 1999) 10 years in which to claim any justified extension of their Arctic continental shelf. Canada, Denmark, Norway and Russia have already made their bids. The US is eager to follow suit, but is yet to ratify the UN Convention under which this carve-up is taking place. Russia's first attempt to claim rights to the Lomonosov Ridge was in 2001, but the claim was rejected, citing a lack of scientific evidence. Two years ago, a Russian expedition using two submarines descended to the seabed 4km below the North Pole. Researchers planted a titanium Russian flag and took water and soil samples for analysis. The mission's aim was to justify Russia's claim on 1.2m sq km of Arctic territory. Historically, arbitrariness in territorial disputes has often proved more efficient than international treaties and legal moves. The Times published a letter from Robert Headland of Cambridge University's Scott Polar Research Institute, in which he stated that, as early as 1991, during his expedition to the North Pole, he had already taken the opportunity to drop a coin of the realm overboard. Thus a British national symbol, with an image of the Queen, came to rest on the bed of the Arctic Ocean 16 years before the Russian flag. Although ostensibly a joke, the quote illustrates just how tense things are in the region. Fortunately, disputes over the continental shelf can still be resolved in a civilised manner. The five nations with legitimate claims on Arctic territory are trying to define the intraregional boundaries through international legal means and negotiations. If they fail to reach an agreement, the region risks falling prey to the ambitions of many non-Arctic countries who could feel free to request open access to Arctic wealth. The region's future will depend on which of the two strategies - that of national self-interest and confrontation, or one of mutual benefit - will finally prevail. The most pragmatic assumption is that Russia, the US, Canada and other Arctic nations should come up with a joint comprehensive strategy for sustainable use of the region's resources. Otherwise, the Arctic is likely to become another theatre for military action. All states bordering the Arctic claim rights to its continental shelf. The Arctic nations are the US, Canada, Russia, Denmark (Greenland) and Norway. Three other polar states - Iceland, Sweden and Finland - have no marine borders with the Arctic, yet could also make claims. The United Kingdom, Germany, Japan, India and China are also increasingly interested in the Arctic reserves.